YPSA consortium organized ‘Flip Chart launching & Orientation Program’ for the peer educator (Garments Worker) at Zilla Shilpakola Academy, Chittagong on 9 February. 30 Master Trainers & 200 Peer Educators attended the program. Prof. Dr. A Q M Serajul Islam, Advisor of YPSA consortium & Ex. 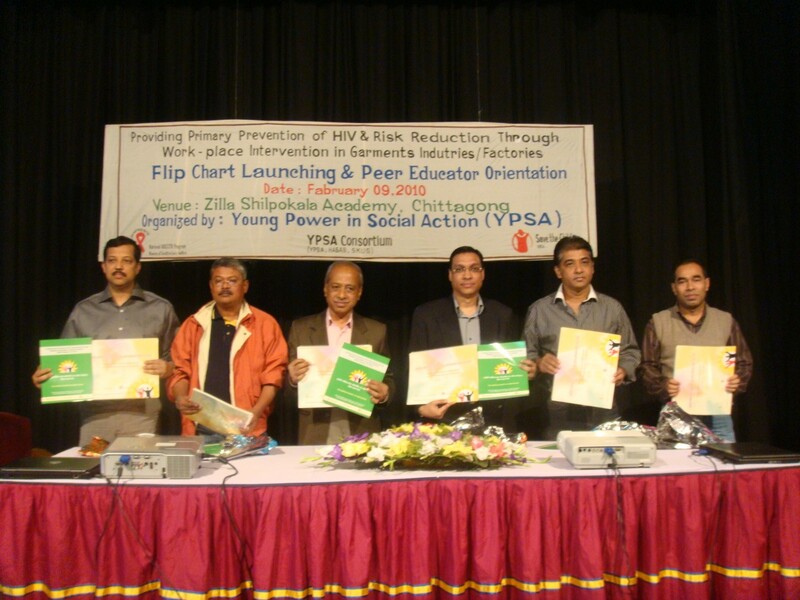 Head of Department – Dermatology & STDs of Chittagong Medical College chaired the program. BGMEA Director Mohammad Farhad Abbbas, Mr. A M Chowdury Salim, Mohammad Musa, Mr. Belayet Hossain – Chairman, standing Committee (Health), BGMEA, Mr. Shaikh Masudul Alam – Manager BBC & Advocacy, Save the Children USA & Mr. Mahabubur Rahman – Director ( Field Operation) were present as a honorable guest in Flip Chart launching ceremony program. This Program conducted by Mr. Akbar Reza – Program & Technical Specialist, YPSA Consortium. The consortium has been implementing the project “Primary Prevention of HIV & Risk Reduction through Work-place Interventions in Garment Factories (GFATM912)”.